The website is the centerpiece of any digital marketing effort. When a website isn't performing optimally, a business can feel its effects. A B2B company that provides custom cutting tools for manufacturers faced the challenge of overcoming a static 17-year-old website that served as little more than a brochure for the company. The fix featured a total redesign that resulted in a website with responsive design and SEO elements. In addition, the website received a robust, brand-new paid search program. Find out how this complete website makeover increased conversion 470%. 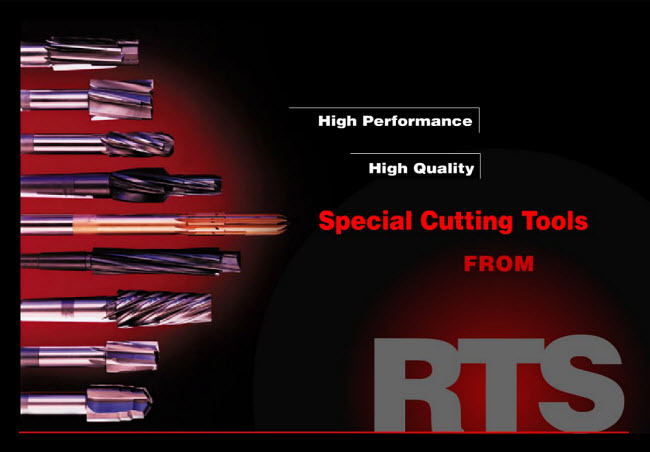 RTS Cutting Tools, Inc. is a manufacturer of blueprint special cutting tools manufactured out of high-end materials such as high-speed steel and carbide. Sal Garbarino, Sales Marketing Manager, RTS Cutting Tools, Inc., explained the company's specialized products: "When we say 'blueprint special,' we're not competing against those people that make standard tools. Ours are special cutting tools — they've got some kind of special diameter, special length, that type of thing." RTS's business is mostly directed toward the hydraulics industry, such as automotive, aerospace and appliances. These are industries where the manufacturing process might require a custom tool. Its customers range from third-party vendors to buyers within its core industries. RTS's customer focus is also very regional, with an emphasis on Michigan and the Midwest. At the most basic level, its target persona is a design engineer requiring specification and measurements on products. RTS Cutting Tools had a specialized product line for customers seeking custom cutting tools, and its marketing was driven to generate new leads and attract new customers. The main problem was its severely out of date website — a relatively static 17-year-old website that had just been added to over the years. According to Garbarino, "We had added stuff to it, patched it up, put a few things here and there, but it kind of looked that way. It looked like it was patched up. It looked like it wasn't with the times." There were other issues with the site, he added, including the site not rendering properly across different devices and browsers. Read on to find out the steps taken in the website redesign, and learn how RTS used paid search, SEO and analytics to achieve a 470% increase in conversions. RTS understood that its existing website was behind the digital marketing curve. Therefore, the first move was to meet with four Internet marketing vendors before selecting a third-party team to help bring its website and online marketing up-to-date. Garbarino explained the internal team at RTS wasn't really aware of, or active in, responsive design, online marketing or paid search. When this campaign was started in April 2013, the focus returned to investment in the form of gaining convertible traffic seeking out RTS' custom cutting tools. The old website was viewed basically as an online brochure, and the team really didn't expect any sort of business performance from the static Web presence, Garbarino said. The new site had two requirements — responsive design, so it would render properly across different hardware and software, and an online product catalog. The RTS website redesign began with a content and technical audit of the original site along with a review of websites by competitors. From there the team defined the overall branding, look and website functionality and then created a site map and wireframes. After review and final site map approval, the team began gathering content for the new website. At this stage, the team worked with the different wireframes created in the previous phase and developed a final design concept for the homepage and for subpages within the new site. With the framework of the new website in place, the site was populated with content. This was done by reviewing the content, integrating it into the website and reviewing the content layout. At this stage, website analytics were integrated into the new site. At the final stage, the new website was tested for cross browser compatibility with Internet Explorer, Firefox, Chrome and Safari, and the team undertook a final site architecture and design review with checkpoints throughout the entire development and management team. It was at that point the new site was officially launched, and the team began the process of post-launch review, modification and adjustment. The basic SEO strategy employed by the team involved targeting key terms to use in website content, title tags, meta descriptions and other page elements, and these key terms were revised monthly. For example, there was high interest in the key phrase "high-speed cutting tools," so the team developed new site content and created a page specifically to organically target searches for that phrase. This also occurred with internal data. 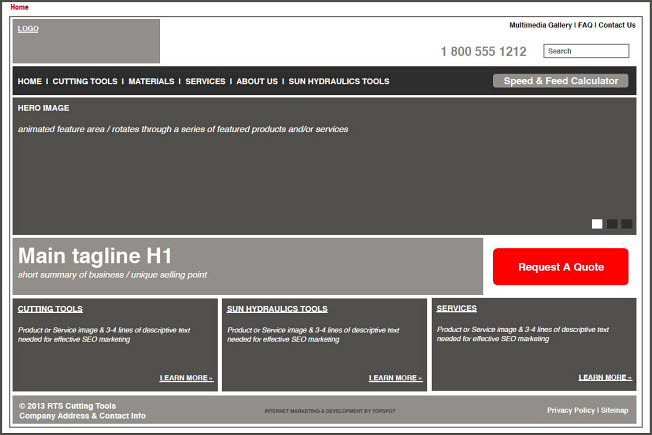 For example, when the team found a high level of interest in "coolant-fed tooling" in onsite form completions and within internal site search, specialty pages for that product line were created. Another SEO tactic was employing a schema markup for customer reviews and testimonials. 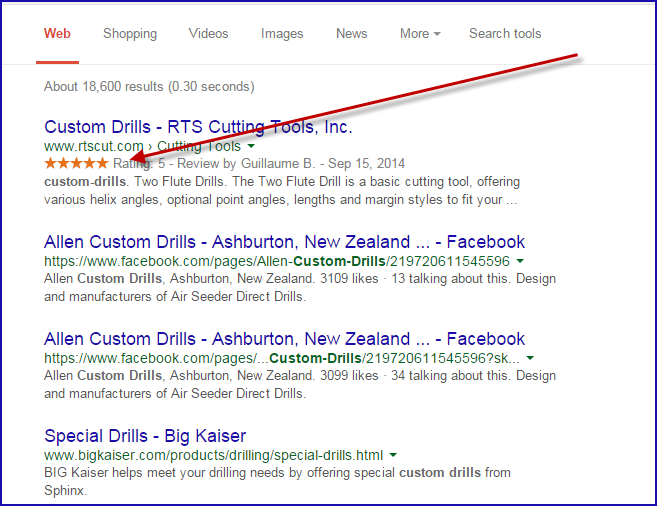 The team took reviews from RTS clients and added a testimonial graph to the webpage so that search results pull up a star rating for terms such as "custom drills." According to Garbarino, the PPC program focused on RTS' core products, including special cutting tools, counterbores and hydraulics. To uncover keywords for the paid search program, the team met to determine key terms to target. They also utilized keyword research tools, competitor websites and manual Web searches to uncover any additional potential keyword opportunities, adding plural version of keywords and long-tail key phrases into the mix. The PPC ad links went to specific website sections — such as "counterboring tools" — rather than dedicated paid search landing pages. Through a Google Analytics multi-channel funnel report, the team found that RTS prospects visit the website multiple times before converting. The decision to send ad clicks to the product section was an effort to provide the most consistent user experience over the multiple touch points. To continue refining the paid search program, the team met monthly to review search queries that entered the website via PPC ads. This analysis helped uncover the terms that were working as well as the queries that weren't bringing in qualified leads and needed to be added to the program as negative keywords. Because the old page was essentially static and was not tracked in any way, it was important to implement analytics, tracking and measuring of website activity in RTS' new website and digital marketing activities. Garbarino explained the team conducted monthly meetings to go over all the data from the entire effort. He said, "I think we've got a pretty good handle on what the website's doing and how much it's generating for us." "We're always talking about how we can improve the site," he added. Garbarino also mentioned that the sales team helped in data collection by qualifying new leads and entering that information into the system. Garnarino can then extract the data, put it into a spreadsheet and analyze the information. 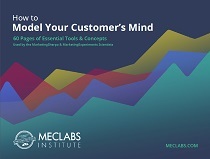 One place where website tracking and measuring impacted RTS' marketing was its counterbore product. "We were seeing a lot of queries or searches for it, and people were coming to the site for it, but we weren't getting any lead generation out of it," Garbarino said. This insight led to providing more detailed descriptions for the products RTS offers, but that shift didn't produce any positive results. The problem was traffic came from people looking for standard parts, not RTS' custom parts. The solution was to "de-optimize" for the key phrase "drill bits" by removing it from headings and sub-heads, while adding content regarding RTS' specific bits. These changes resulted in reducing Sales time, which was previously being wasted replying to unqualified leads after website visitors learned RTS doesn't offer standard counterbore drill bits. Although the new website began generating leads through the different online forms, Garbarino said new lead processing at RTS is still very manual. Any leads that come into RTS, either via online forms on the new website or phone calls, are contacted by either the sales manager or a sales team member within 24 hours to qualify that lead. From there, qualified leads are manually entered into RTS' enterprise resource planning (ERP) system. He added that leads generated via the website were tracked separately in order to collect performance data on quotes, orders and activity. 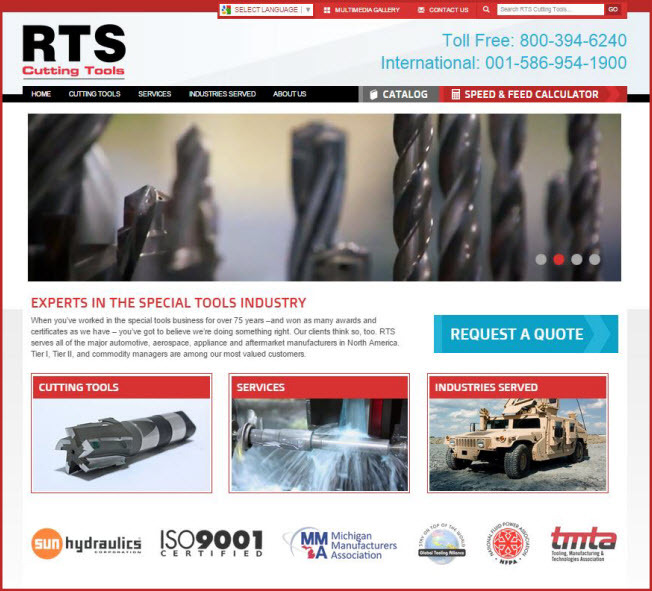 The primary result of the total website redesign at RTS Cutting Tools was a 470% increase in conversions as measured in quotes delivered to prospects. Its paid search program impression share for targeted key terms ranges from 70 to 80%. Garbarino said one takeaway from shifting from a 17-year-old static website to a fully functioning site with responsive design, SEO tactics implemented both on the front and back end and a robust paid search program is handling the challenge of a higher level of engagement with prospects. "When [the website] starts generating traffic, you've got a lot of good with the bad. You're going to do a lot of quoting, or you're going to weed out a lot of those customers that don't fit with you. It is a lot of work, and you just have to be ready for it, and track as much as possible," Garbarino said.